Among the great French religious modernists of the twentieth century, Joseph Turmel was a native of Rennes. His family was both very large and very poor, his parents pious and unlettered. However, Joseph’s keen intelligence was noticed early. He entered the large Seminary of Rennes and subsequently studied theology at the University of Angers, was ordained priest in 1882 and immediately appointed professor of dogmatic theology at the Seminary of Rennes. Turmel’s faith was ardent, and he worked hard to defend the Church against the incredulous. However, he himself became subject to doubts with the appearance of Gesenius’ commentary on Isaiah. Despite Turmel’s attempts to convince himself of error, those doubts grew with his continued study of the Pentateuch. On March 18, 1886 he finally realized that he could do nothing against facts which were indubitable, and declared to himself that he was no longer a believer. 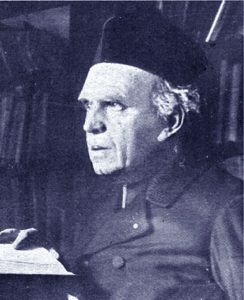 Turmel retained his position as chaplain to the Little Sisters of the Poor of Rennes (1893). He continued his solitary researches without any real hope of publication. Luckily, a priest from Breton made Turmel’s Angelology known to Alfred Loisy and Lejay. These included Turmel on their production staff of the Revue d’Historie et de Litterature Religieuse. Several of Turmel’s works were published in its pages under pseudonyms and elicited much attention. Soon Turmel was linked to the works through their quality and style and the revenge of orthodoxy was not long delayed. In 1903 he resigned his position as chaplain and took up an insignificant post under a parish priest. He made use of ample spare time to write. Turmel’s public persona disappeared while a stream of his works appeared under numerous pseudonyms from 1909 to 1930. The value of these works comes from direct contact with the ancient texts. A novel vision, together with a prodigious knowledge, allowed Turmel to point out inconsistencies in belief. He is the greatest historian of Christian dogma. Turmel’s method was by nature rigorously scientific and this enabled him to show, for example, that the Ignacian letters must be dated much later than is customary. Their earliest redaction is Marcionite and can be no earlier than 135 CE, while their revisions date to 190-211 CE. It follows that the works cited by Pseudo-Ignatius could have been edited late and, finally, that the bodily existence of Jesus was unknown in the second century of our era—at least among some Christians. Turmel also illuminated Marcion’s role in relation to the Fourth Gospel, where a spiritual Christ opposes a physical one. He likewise made valuable observations regarding the Pauline literature, in which he was able to distinguish three stages: (1) short letters attributable to Paul; (2) Marcionite revisions; and (3) Catholic additions. Turmel’s research opened new pathways which were followed by Loisy, Guignebert, Merlier, and by those in the mythicist school to which, however, Turmel himself did not belong. Turmel’s style is concrete, very clear, and is often accompanied by a humorous touch. He has the gift of being able to tackle knotty doctrinal problems with charm. His autobiography appeared in two volumes (1935 and 1937). The unfortunate life of this long misunderstood and reclusive genius did not assure him the high-profile impact of a Renan or Loisy. Yet, in the end, Turmel may surpass others in the sheer power of his insights and the vigor of his arguments. – Dujardin, Édouard. Grandeur et décadence de la critique. Sa rénovation. Le cas de l’abbé Turmel. Paris: Messein, 1931. – Sartiaux, Félix. Joseph Turmel, prêtre, historien des dogmes. Paris: Rieder, 1931. – Thirteen of Turmel’s books are available for purchase. – Turmel’s Histoire de la théologie positive (7 vols.) is online here.